This page contains Boy Scout Awards and the requirments to earn them. Each of these awards may be earned by Youth and many by Adult Leaders, see the requirements. The National Honor Patrol Award is given to Patrols whose members make an extra effort to have the best patrol possible. 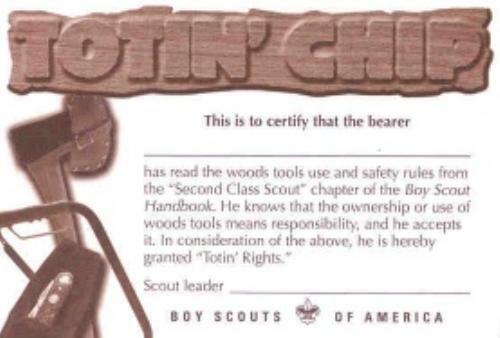 The Totin' Chip certification grants a Boy Scout the right to carry and use wood tools at Scouting events. Even though the patch is shaped like a pocket flap, wearing it on a pocket flap does not conform to uniform standards. Per BSA: "The Totin' Chip Patch is considered a 'Temporary Patch' and, if worn, should be worn centered on the RIGHT Pocket of the Boy Scout Uniform Shirt. It should NOT be sewn on a pocket flap." 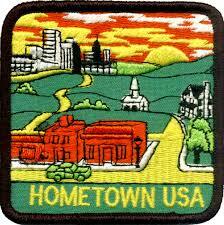 * The Paul Bunyan Woodsman award patch is not for uniform wear and should only be affixed to a blanket or backpack. I will follow the Outdoor Code and the principles of Leave No Trace. Even though the patch is shaped like a pocket patch, wearing it on a pocket flap does not conform to uniform standards. 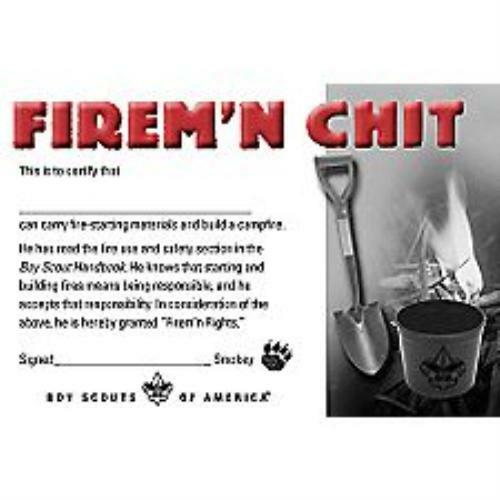 Per BSA: "The Firem'n Chit Patch is considered a 'Temporary Patch' and, if worn, should be worn centered on the RIGHT Pocket of the Boy Scout Uniform Shirt. It should NOT be sewn on a pocket flap." The Recruiter Strip may be awarded to Cub Scouts and Boy Scouts and is worn below the right pocket on the uniform. Typically, only ONE strip is awarded to a boy while he is a Cub Scout, and another may be awarded while he is a Boy Scout. The Leave No Trace Award for Boy Scouts and Venturers is designed introduce and expand boys' knowledge of the principles of Leave No Trace. Share with another Scouter or Venturing leader your understanding and knowledge of the Camping and Environmental Science merit badge pamphlets. Actively assist (training, advice, and general supervision) a Scout in planning, organizing, and leading a service project related to Leave No Trace. Assist a minimum of three Scouts in earning the Leave No Trace Awareness Award. Plan and conduct a Leave No Trace awareness for Scouts, Venturers, Scouters, or an interested group outside Scouting. Do you enjoy camping under the stars, rafting a whitewater river, or hitting the trail afoot, on a bike, or even on a horse? Can you pitch a tent, find your way, and bandage an ankle using only materials in your pack? Are you prepared to do any of these in rain, snow, sleet, or heat? If so, the National Outdoor Awards are for you. There is nothing virtual about these awards—you can earn them only by demonstrating both knowledge and experience in the outdoors. So, if you are a Boy Scout or Varsity Scout and think you are tough and disciplined enough to hike or ride the miles, camp the nights, and run the rivers or lakes, then read on and see if the National Outdoor badges or possibly the National Medal for Outdoor Achievement could be for you! 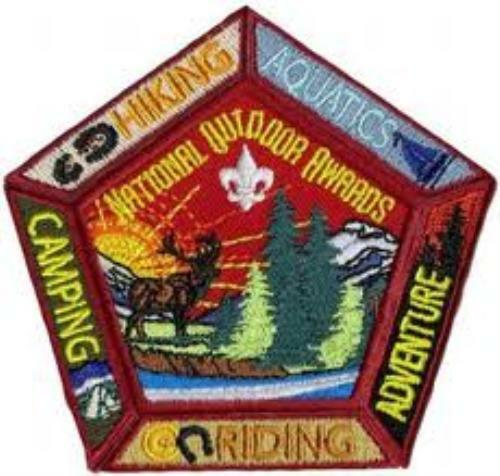 The five National Outdoor Badges recognize a Boy Scout or Varsity Scout who demonstrates both knowledge and experience in camping, hiking, aquatics,riding, or adventure. Scouts earning the National Outdoor badges have demonstrated that they are knowledgeable, safe, and comfortable in the outdoor activity covered by the badge. Earn the Camping merit badge. Earn two of the following three merit badges: Cooking, First Aid, Pioneering. Complete 25 days and nights of camping—including six consecutive days (five nights) of resident camping, approved and under the auspices and standards of the Boy Scouts of America—including nights camped as part of requirements 1 through 3 above. Earn the Swimming and Lifesaving merit badges. Earn the Mile Swim BSA Award. Earn at least one of the following merit badges: Canoeing, Rowing, Small Boat Sailing, Whitewater. Complete at least 25 hours of on-the-water time, applying the skills that you learned in the merit badges. Complete at least 50 hours of any combination of swimming, canoeing, rowing, small-boat sailing, or whitewater activity under the auspices of the Boy Scouts of America, including time spent in requirements 2 through 4. Horsemanship merit badge and 50 miles of horseback riding. Complete 200 miles of riding activities, either on a non-motorized bike or a stock animal, under the auspices of the Boy Scouts of America, including the miles in requirement 2. Complete either the Wilderness Survival or the Emergency Preparedness merit badge. Plan and lead, with the approval of your unit leader, an outing for your troop, team, patrol, or squad in two of the following activity areas: hiking and backpacking, aquatic activities, or riding. Include in each outing a service element addressing recreational impacts resulting from that type of activity. With the approval of your unit leader, you may plan and lead the outings for another Cub Scout pack, Boy Scout troop, Varsity Scout team, Sea Scout ship, or Venturing crew. The Centennial Quality Awards program is designed to recognize units, districts, councils, areas, and regions in achieving excellence in providing a quality program to a growing youth population in America at all levels of the Boy Scouts of America. The emblem is worn on the right sleeve of the official uniform. The top of the award should be placed 4" below the top of the American flag. Only the Quality Unit Award for the current year may be worn on the uniform. Qualifying Troops and Packs receive a ribbon for display on their Unit's flagpole. 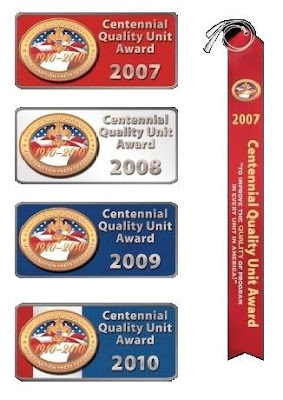 Between October 31 and December 31 of each year, a “Centennial Quality Achievement form” is completed and signed by the unit and district leadership, usually a commissioner, after they meet to review their achievements for the calendar year compared to the goals they established at the beginning of the year. • Evaluate where the unit is on accomplishing the goals established for each criterion. • The meeting will allow the district leadership to meet with the unit leadership before year-end. • If the unit has not yet accomplished all of their goals, they will have time to develop an action plan to achieve the award before year-end. For a number of years, the Crime Prevention Award has been available to Cub Scouts, Boy Scouts, Varsity Scouts, Venturers, Explorers, and participants in Learning for Life, as well as adults. ALL participants - including those not registered in Scouting or Learning for Life - have been eligible to earn the Crime Prevention Award provided they fulfill the requirements of the two phases outlined below, and detailed on the appropriate application forms. Of course, promoting Crime Prevention is still a valid project for Scouts, and can be done, even without the opportunity to get this award. The award can be earned at EACH Level, using different requirements. The Award for completion of the requirements is the patch shown at the top of this page, and a wallet card, shown at the bottom of this page. In addition, a wall certificate is available for individuals, families, dens, packs, patrols, teams, crews, posts, or other groups who participate in the program. The pin shown at the bottom of this page can be presented to youth and adults who participate in and/or give leadership to the program. The patch is worn on the uniform shirt, centered on the right pocket as a TEMPORARY patch. Only ONE Temporary patch may be worn at a time. The pin is NOT worn on the uniform. Phase I is basically an individual, or Youth and Family phase, and Phase II is designed to be a group, or Youth and Unit phase. Carry out the activities identified in this Phase I section. Boy Scout Handbook, pages 371-373. Boy Scout Handbook, page 341. 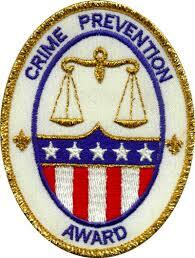 Visit a government agency responsible for crime prevention programs. 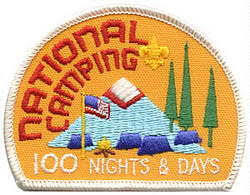 The National Camping Award is both an annual and a cumulative award for units which receive a ribbon for the troop flag. Individuals, scouts, and scouters can also qualify for a cumulative patch by participating in campouts with their families, or patrols as well as unit campouts. Any combination of unit and individual campouts can be used to qualify for the individual cumulative award. Since the BSA's inception in 1910, members have learned to live the principles of the Scout Oath and Law through community services and "helping other people at all times." With that history in mind, the BSA has developed a service initiative - Good Turn for America. What began with a singular act of service on a foggy London night quickly evolved into daily Good Turns and then into more encompassing national initiatives. These have included selling war bonds, collecting rubber and scrap metal, growing victory gardens during World War II, and more recently, Scouting for Food. We now have the opportunity to raise our levels of community service and increase awareness of the Scouting program within our neighborhoods. Nationally, the Boy Scouts of America has partnered with The Salvation Army, Habitat for Humanity, the American Red Cross, the American Cancer Society, America's Second Harvest, and the Department of Homeland Security to increase our efforts in meeting the challenges of the 21st century. Good Turn for America will build on our members' and participants' current service efforts and will also include important partnerships with other community service organizations. These partnerships will provide many additional avenues for all of our members and participants to provide community service in their neighborhoods. Click here to log in your unit's service hours and be a part of the nation-wide Good Turn for America. The Physical Fitness Award can be earned at all levels of Scouting. Using the BSA references listed after the seven major components, give a presentation to a BSA or other community youth group (at least eight youth participants) on cardiovascular fitness, diet, the health benefits of regular aerobic exercise, exercise recommendation for the Scout-age group, and healthy lifestyles. The Den Chief Service Award is awarded to a Boy Scout who has served as a Den Chief and completed the requirements listed below. 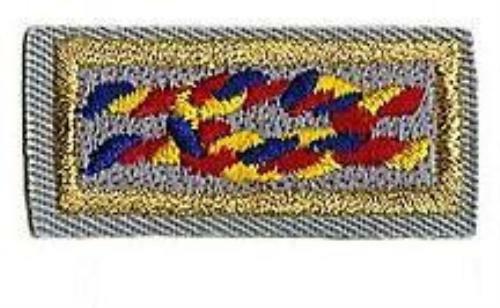 Den Chiefs who earn the award may wear the Service Award in addition to the standard den chief cord of their office, and may continue to wear it for as long as they are a youth Scout. The requirement information in (italics) above is from the detailed requirements in the Den Chief Handbook, No. 33211B. The Braids shown at the Top of this page ( Red White & Blue) are the Den Chief Service Award Braids. The Founder’s Bar is worn by all youth and adults whose names are on a new-unit charter or who officially join the new unit before the unit recharters for the first time. Members of veteran units still in operation who were on the original charter may also wear the Founder’s Bar with that unit’s numerals. This recognition will emphasize the importance and pride of forming and nurturing a new Scouting unit. While it does not guarantee the unit will become a Quality Unit, it does encourage multiple-year rechartering so members may continue to wear the bar. Once the unit has completed its charter, members may begin wearing the Founder’s Bar. The Founder’s Bar is worn on the left shoulder below the unit numerals. The Founder’s Bar, certificate, and pocket certificate are available for distribution. Contact your local Scout shop for more information. 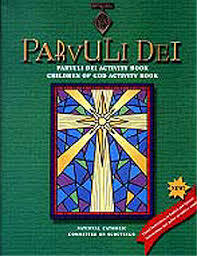 Many religious-faith groups have programs of intensive religious education for individual Tiger Cubs, Wolf, Bear, Webelos, Boy Scouts, and Venturers. Religious Emblems are designed to recognize youth and adults who demonstrate faith, observe the creeds or principles of the faith, and give service. Religious emblems are not Scouting awards; they are presented by religious groups to boys who earn them. The Religious Emblems programs are administered by various religious institutions and recognized, but not sponsored, by the BSA. These are generally recognized by a medal and an embroidered square knot. In some denominations, four different awards may be available. Some programs allow Girl Scouts or youth not in Scouting to participate in these same programs and be presented with the same medals but only a member of the Boy Scouts America can wear the BSA knots. The medals are usually only worn on special occasions, pinned immediately above the top of the left pocket flap of the uniform shirt. 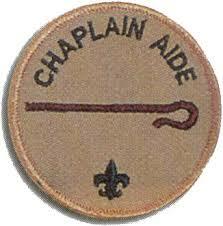 Youth may earn an emblem whether or not they are members of a unit operated by a religious organization. The intent of the program is to work directly with your own religious leader or, in some cases, a layperson (mentor) designated by that religious leader. The Interpreter Strip is not an award, per se -- it's SOLE purpose is to give others an immediate, visual cue that you are able to perform as an interpreter, when needed. That's why the patch is unique in it's appearance; that's why it's placed near your name tag on your uniform; and, that's why it's displayed in the other language. E.g., Deutsch, instead of German. While the BSA Supply Division currently only carries Interpreter Strips for American Sign Language (ASL), Arabic, Cantonese, Dutch, French, German, Greek, Hebrew, Italian, Japanese, Mandarin (Simplified), Mandarin (Traditional), Portuguese, Russian, Spanish, and Vietnamese, that does not, in any way, mean that these are the only ones authorized for earning the Interpreter Strip. You can wear an Interpreter Strip for any language (other than English), as well as American Sign Language, Signing (which is not the same as American Sign Language), and even Morse Code. And no, spoof patches are NEVER authorized. The International Activity badge (#00144) is a 3-inch diameter patch which is worn as a TEMPORARY EMBLEM on the right pocket of the Scout or Scouter to recognize participation in unit, council, and world scouting international activities. It is NOT worn in place of or alongside the World Crest emblem. There is also a 5-inch jacket patch (#00145) available for authorized wear. Each local Council has the authority to determine requirements for the patch. There is no time restriction for earning the International activity patch. To earn the Silver Award, a Boy Scout troop, Varsity Scout team, or Venturing crew must complete 10 mandatory requirements and six elective requirements. Youth and adult members of a unit earning the Silver Award are entitled to wear the silver-bordered BSA Ready & Prepared Award patch, and the unit is entitled to display the silver BSA Ready & Prepared Award ribbon. Units earning the Silver Award also will be acknowledged in Boys' Life magazine. Apply for this award at the time of rechartering. Two or more registered members, including at least one adult, are trained in first aid and CPR by a recognized agency such as the American Red Cross or the American Heart Association. At least 75 percent of unit members have completed requirements for the To Be Physically Fit BSA Award or the Quest Award. Details on these awards can be found on the BSA Web site. The unit has earned the Emergency Preparedness, BSA, Award. Details about this award are located on the BSA Web site. There are NO formal requirements for these patches. Each Unit establishes the procedure for awarding the strip. 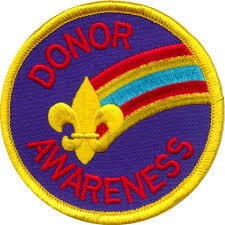 Usually, a Donor Awareness Patch is awarded to a Cub Scout or Boy Scout the first time he is successful in getting an adult family member, friend, relative, or other acquaintance to agree to become an organ donor, and to fill out and carry an Organ Donor Card. For a number of years, BSA has offered the Donor Awareness Patch to Cub Scouts and Boy Scouts. It is worn on the right pocket of the uniform as a temporary emblem. BSA has reduced their emphasis on this program, but has not discontinued it completely. The patch is still being produced, but some Scout Shops™ may not routinely stock the patch. To avoid disappointing Scouts, CHECK FIRST to see if any are available in your area before promoting this program and patch. Of course, promoting Donor Awareness is still a valid project for Scouts, and can be done, even without the opportunity to get this patch. The William T. Hornaday Awards are presented for distinguished service in natural resource conversation for units, Scouts, Venturers, and Scouters. Venturers may earn the Hornaday badge or the Hornaday Bronze or Silver Medal. Venturing crews or Sea Scout ships may earn the William T. Hornaday Unit Award. "Unusual prizes are to be won only by unusual services." 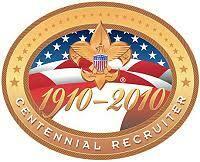 Boy Scouts and Varsity Scouts may earn an individual youth member award or a troop/team unit award. All award recipients must meet age, elective work, project and documentation requirements. Eligibility: Any Boy Scout or Varsity Scout completing requirements before his 18th birthday is eligible to earn the William T. Hornaday Award for Boy Scouts. The William T. Hornaday Silver medal is the BSA's highest individual youth member conservation award. 1. Earn First Class rank. 2. Earn the Environmental Science merit badge. 1. Describe the origination of the idea. 2. State the project's purpose and identify the conservation issue it addresses. 3. Conduct research, investigation, and study. 5. Implement and manage the projects. 6. Demonstrate leadership and involve others. 7. Describe how the project influenced the attitudes of others. 8. Record the time and resources devoted to each project. 9. Explain the relationships among projects, if projects are interrelated. Each project, however, must be from a different category of conservation, as described earlier. Detailed information about the William T. Hornaday Awards, including application forms, are available online here or here. Just the application form can be downloaded here. Either Soil and Water Conservation OR Fish and Wildlife Management merit badge. Unlike the Cub Scout version of the patch, no conservation effort is outlined in the requirements for the Boy Scout version. The reason the volunteer aspect has been dropped in the jump from Cub Scouts to Boy Scouts is unclear, as community service oriented projects of maintenance and restoration are common to many requirements for Special Opportunity awards, as well as to Scouting in general. This alteration of approach may be in light of the fact that specific badge requirements encourage the Scout to conduct or participate in a project of their own while working on the badge, and they may very well have already been involved in some type of project while working on the badge. These service-based requirements however, are purely optional, as there are multiple alternatives. It is unclear whether this is in fact a loop hole, or intended by the awards' founders. See Fish and Wildlife Management requirement 5c and Soil and Water Conservation requirement 7f. The Conservation Good Turn Award is an opportunity for Scout units to join with conservation or environmental organizations (federal, state, local, or private) to carry out a conservation Good Turn in their home communities. Working together in the local community, the unit and the agency plan the details and establish the date, time and location for carrying out the project. Conservation projects should involve the entire unit - scouts, leaders, and family members. Cub Scouts and Webelos Scouts participating in the Conservation Good Turn can also meet some advancement requirements. As a den or pack, adopt a park and keep it clean. Organize or participate in a recycling program. Participate in a beach or waterfront cleanup. Record the items collected and determine the possible harmful effects to wildlife. Establish a nature trail, plant vegetation, or carry out other needed projects as requested by the camp ranger at a local BSA camp property. "The Historic Trails Award is an award that may be earned by members of a Boy Scout troop, Varsity Scout team, or Venturing crew for hiking a trail listed in Nationally Approved Historic Trails and completing a project related to the trail." Boy Scouts, Varsity Scouts, Venturers, and leaders are eligible to earn this award. It is presented as a cloth (No. 00187) or leather (No. 00243) Boy Scout and Scouter, equipment decoration. . The award is not worn on the uniform. It may be worn on a jacket or patch vest or placed on blankets, backpacks, or other personal equipment. Cooperate with an adult group such as a historic society to restore and mark all or part of this trail or site. (This may be done during the hike or overnight camp.) Or cooperate with such a group to plan and stage a historic pageant, ceremony, or other public event related to this trail or site -- such event should be large enough to merit coverage by the local press. 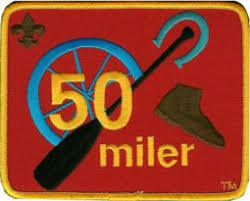 "The 50-Miler Award is presented to each qualifying individual for satisfactory participation in an approved trip. In order to qualify for the award the group of which the individual is a member must fulfill all of the following requirements." It is presented as a cloth (No. 00188) or leather (No. 00244) Boy Scout and Scouter, equipment decoration. . The award is not worn on the uniform. It may be worn on a jacket or patch vest or placed on blankets, backpacks, or other personal equipment. In order to qualify for the award the group of which the individual is a member must fulfill all of the following requirements. Unit or tour leader must then file a 50-Miler Award application with the local council service center. The application gives additional details about planning the trip. Provisional groups and individuals are participants that do not belong to the same charted unit. Boy Scout, Varsity Scout, or Venturer units, including provisional individuals. Provisional groups (participants not from a single unit); however, chartered unit participation is most desirable. Sea Scouts are only eligible when participating as part of their own chartered ship. Sea Scouts participating as members of a provisional ship are not eligible for this award. Public Lands Day involves citizen volunteers in cleaning and maintaining nearby public lands. This event falls annually on the Saturday following Labor Day. The purpose of Public Lands Day is to instill a sense of pride and ownership among citizens through hands-on participation in continuing education and improvement projects on public properties. "BSA Lifeguard is a three-year training designation awarded to Boy Scouts, Venturers, and adults who meet prescribed requirements in aquatics skills, Safe Swim Defense, Safety Afloat, first aid, and emergency action." 1. Submit proof of age. You must be at least 15 years old to participate. 2. Submit written evidence of fitness for swimming activities(signed health history). 3. Swim continuously for 550 yards, including at least 100 yards each of the following strokes in good form: front crawl, breaststroke, elementary backstroke, and sidestroke. 4. Immediately following the above swim, tread water for two minutes. 5. Starting in the water, swim 20 yards using a front crawl or breaststroke, surface dive 7 to 10 feet, retrieve a 10-pound object, surface, swim with the object 20 yards back to the starting point, and exit the water, all within 1 minute, 40 seconds. 6. Demonstrate reaching assists from the deck using an arm, a rescue tube, and a pole. 7. Demonstrate throwing assists using a throw bag and a ring buoy with line attached. Throw each device such that the line lands within reach of a conscious subject 30 feet from shore. a. Rescue of a conscious subject in deep water using a rescue board, kayak, rowboat, canoe, or other rescue craft that would be available at your local facility. b. Repeat for an unconscious subject. 9. Demonstrate an entry and front approach with a rescue tube to a conscious subject in deep water 30 feet away from shore. Extend the rescue tube within the grasp of the subject and then tow the subject back to the entry point, providing direction and reassurance throughout. 10. Demonstrate an entry and rear approach with a rescue tube to a conscious subject in deep water 30 feet away from shore. Grasp the victim from behind using a scoop technique under the arms to support the subject against a rescue tube squeezed between the victim's back and the rescuer's chest. Reassure the subject and tow the subject to shore. 11. Demonstrate use of a rescue tube to assist two subjects grasping each other. 12. Demonstrate both front and rear head-hold escapes from a subject's grasp. 13. Demonstrate a feet-first entry in deep water with a rescue tube and swim an approach stroke 25 yards within 25 seconds while trailing the tube. 14. Demonstrate an entry and front approach with a rescue tube to a face-down unconscious subject at or near the surface in deep water. Use a wrist tow to place the subject face-up on the rescue tube and use a one-arm tow to the closest point of safety. 15. Demonstrate an entry and rear approach with a rescue tube to a face-down unconscious subject at or near the surface in deep water. Use a scoop technique to position the rescue tube between the subject and the rescuer's chest, then either lean back or rotate to bring the subject face-up. Tow the subject to the nearest point of safety using either a two-arm tow or switching to a one-arm tow. 16. Demonstrate an entry and approach with a rescue tube to an unconscious subject submerged face-down at or near the bottom in 6 to 8 feet of water. Bring the subject to the surface and tow to the nearest point of safety. 19. Demonstrate head-splint (extended arm rollover) in-line stabilization for a face-down subject with suspected spinal injury in very shallow water (18 inches or less). 22. Demonstrate in-line stabilization for a suspected spinal injury in deep water, swim the subject to shallow water, confirm vital signs, and, with the assistance of three others, remove the subject from the water using a backboard with straps and a head immobilization device. 23. Correctly answer 80 percent of the questions on the BSA Lifeguard written test covering Safe Swim Defense, aquatics procedures at BSA camps, guard duties, emergency action plans, surveillance, and water rescue. Review any incomplete or incorrect answers. 24. Show evidence of current training in American Red Cross First Aid (valid for three years) and American Red Cross CPR/AED for the Professional Rescuer (valid for one year) or equivalent (includes any training for a camp health officer recognized by BSA national camp standards). 25. Serve as a lifeguard, under supervision, for at least two separate BSA swimming activities for a combined time of two hours. Afterward, discuss the experience with the lifeguarding instructor. Renewal Challenge — Anyone with a BSA Lifeguard completion card that is current or has expired within six months may renew or extend the training by performing requirements 2 through 24 without attending the standard course sessions. Prior to the testing, the instructor may provide a renewal training session to review and update skills and information. Summer camp aquatics directors should renew training for aquatics staff members during precamp training while emphasizing local camp facilities, procedures, and emergency action plans. Crossover Challenge — Anyone who holds current training in American Red Cross Lifeguarding, American Red Cross Waterfront Lifeguarding, or other lifeguard training programs may obtain a BSA Lifeguard completion card by performing requirements 1 through 25 without attending the standard course sessions. The lifeguard training program that issued the training certificate must be recognized by the local or state regulatory agency that sets standards for lifeguards at youth camps. The instructor may provide a crossover training session to review and update skills and information prior to the testing. The applicant may receive credit for requirement 25 if within the past 18 months he or she has served as a lifeguard, under supervision, or has supervised lifeguards, for at least two separate BSA swimming activities for a combined time of two hours. Otherwise, due to BSA procedures not implemented at other lifeguarding venues, the applicant must accomplish requirement 25. Coinstructors — (BSA Aquatics Instructor or BSA Lifeguard Instructor) may each sign a completion card for the other at the conclusion of a BSA Lifeguard course if they satisfy requirements 2–22 and 24. See the Application For BSA Lifeguard, BSA No. 34435, for detailed requirements. 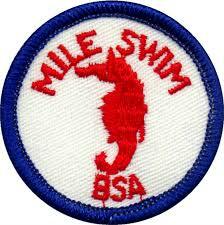 The Mile Swim BSA Award is offered by many Boy Scout Summer Camps as a part of their aquatics program. The patch is not worn on the uniform. It is an aquatic insignia and can be worn on swim trunks. It can also be worn on a jacket or patch vest or placed on blankets, backpacks, or other personal equipment. The Boardsailing BSAprogram has been developed to introduce Scout-age children to basic boardsailing skills, equipment, and safety precautions, to encourage development of skills that promote fitness and safe aquatics recreation, and to lay a skill and knowledge foundation for those who will later participate in more advanced and demanding activities on the water. Kayaking BSA provides an introduction to kayaking skills and safety procedures and serves as a program opportunity for Boy Scout, Varsity, and Venturing units in camp or out. Mastery of Kayaking BSA skills is a first critical step towards satisfying Safety Afloat guidelines for safe kayak excursions. Kayaking activities are limited to Boy Scouts, Varsity Scouts, and Venturers. Additional kayaking information may be found in the Kayaking BSA pamphlet, No. 19-510, the Fieldbook, No. 33104; the Whitewater merit badge pamphlet, 33405; and Varsity Team Program Features, Volume III, No. 34839. 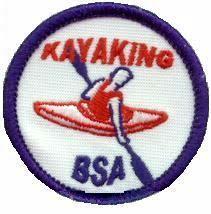 Kayaking BSA is not a merit badge. Scuba BSA introduces qualified Boy Scout, Venturing, and registered adult participants to the special skills, equipment, and safety precautions associated with scuba diving, encourages aquatics activities that promote fitness and recreation, and provides a foundation for those who later will participate in more advanced underwater activity. Scuba BSA is not a merit badge. Scuba BSA is not a diver certification. Before doing other requirements, successfully complete the BSA swimmer test: Jump feetfirst into water over the head in depth, level off, and begin swimming. Swim 75 yards in a strong manner using one or more of the following strokes: sidestroke, breaststroke, trudgen, or crawl; then swim 25 yards using an easy, resting backstroke. The 100 yards must be completed in one swim without stops and include at least one sharp turn. After completing the swim, rest by floating. Explain the function, fit, and selection of mask, fins, and snorkel. Discuss the use of inflatable flotation vests and PFD’s when snorkeling in open water. Adult leaders may wear these adult leader knots to represent the following youth awards. Adult leaders may not wear youth insignia (emblems or patches). Arrow of Light, red and green knot, green to right, No. 05018, for use by adult leaders only. The Arrow of Light is the highest award in Cub Scouting and can only be earned as a Webelos Scout. This is not a restricted knot, and can simply be picked up from the Scout Shop. Eagle Scout, cloth, red, white, and blue knot on tan, No. 05011, Scouter, above left pocket. The Eagle Scout Rank is the highest rank attainable in the Boy Scouting program of the Boy Scouts of America. Unlike the actual Eagle rank patch, this is not a restricted knot, and can simply be picked up from the Scout Shop. This knot is awarded to an Eagle Scouts who further enrolls as a Life Member with NESA (National Eagle Scout Association). You may only wear one Eagle Scout knot. This knot is worn instead of, not in addition to the standard Eagle Scout knot. Venturing Silver Award, cloth, silver knot on green and white, green background to the wearer's right, No. 05027. The Venturing Silver Award is the highest award in the Venturing advancement program. This is not a restricted knot, and can simply be picked up from the Scout Shop. Quartermaster Award, cloth, navy blue knot on white, No. 05009, Sea Scout. The Quartermaster Award is the highest rank in Sea Scouts. This is not a restricted knot, and can simply be picked up from the Scout Shop. Youth Religious Award, cloth, silver knot on purple, No. 05007, may be worn by youth or adult members who earned the knot as a youth member, above left pocket. Each faith has its own requirements for earning its emblem. A knot device may be used to indicate during which level of Scouting the award was earned. Requirements for this award vary from religion to religion. For more information on the specific requirements of your faith, please click here to visit P.R.A.Y. James E West Fellowship Award, cloth, green and gold knot on tan, No. 05026, may be awarded to and worn by youth or adult members. Recognizes individuals who contribute $1,000 or more in cash or securities to their local council endowment trust fund. After you have made the contribution click here to download a nomination form, fill it out, collect the necessary signatures, and turn it in to your council office. If you know of a scouter who made this contribution to their local council, but for whatever reason did not fill out a form to nominate themselves for this award, you may also fill out a form to nominate them and turn it in to the council office on their behalf. Explorer Achievement Award - retired program, cloth, silver knot, red, white, blue embroidery, No. 05526. This was awarded through the Exploring Division prior to August 1998. The Explorer program has evolved into the present-day Venturing program. William H. Spurgeon III Award is the highest recognition for individuals and organizations contributing significant leadership to the Exploring program. Although the award may be awarded to an organization, on the direct-contact adult is entitled to wear the knot. If you feel you know of someone deserving, then click here to download a nomination form. Candidates for this award must be nominated. * Self-nomination disqualifies the candidate. Ranger (Explorers) - retired program, This knot is given in recognition of attaining Exploring's high adventure award, the Ranger Award. If you earned your Ranger Award when you were an Explorer, you are entitled to wear this knot.The Explorer program has evolved into the present-day Venturing program. Ace (Air Scouts) - retired program, This knot is given in recognition of attaining Air Scout's highest rank, the Ace Award. If you earned your Ace Award when you were an Air Scout, you are entitled to wear this knot.The Air Scout, similar to the Sea Scout program, was a branch of the Explorers. However, the Air Scouts program was disbanded back in the late 1950s..
Cub Scout Leader Recognition awards are available to Cub Scout leaders who complete training, tenure, and performance requirements. These awards are presented by the local council. All of the awards require the completion of Fast Start Training, Basic Leader Training for the position, Youth Protection training, and participation in roundtables or a pow wow or University of Scouting. Some require additional supplemental training. One or two years of registered service in the appropriate position is a requirement for each award, and tenure used for one award may not be used for another. Note that Cub Scout Leader Awards may be worn by Boy Scout, Varsity, and Venturing leaders. Also Cub Scouts Leaders may qualify for a number of other award knots: Youth Awards, Leadership Awards, Honor Awards, Religious Awards, James West, Lifesaving - Meritorious Awards. Tiger Cub Den Leader Award, cloth, orange and black knot on gold, No. 17688. Recognizes Tiger Cub Den Leaders for at least one year of service, training, and meeting quality program objectives. Click here to download a Progress Record application card for this award. Cub Scout Den Leader Award, cloth, gold knot on blue, No. 05016. Recognizes Wolf and Bear Cub Den Leaders for at least one year of service, training, and meeting quality program objectives. Webelos Den Leader Award, cloth, gold knot on yellow, No. 05064. Recognizes Webelos Den Leaders for at least one year of service, training, and meeting quality program objectives. Cubmaster Award, cloth, blue knot on yellow, No. 05022. Recognizes Cubmasters for at least two years of service, training, and meeting quality program objectives. Cub Scouter Award, cloth, blue and gold knot on dark blue, No. 05017. The Cub Scouter Award recognizes an adult leader registered in a Cub Scout pack for at least two years, who meets specific training, and meeting quality program objectives. Pack Trainer Award, cloth, royal blue and bright yellow on yellow background. The Pack Trainer Award is for a registered Cub Scout pack trainer who meets specific service, training, and quality program objectives. 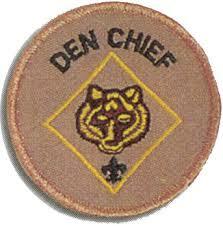 Den Leader Coach Training Award - retired Denotes two year served as a Cub Scout Den Leader Coach in a quality Pack. This knot may no longer be earned. Scouters who have previously earned this knot may continute to wear this knot. Leadership Awards are available to Boy Scout, Varsity Scout, Venturing, Sea Scout, and local council leaders to recognize their length of service, training, and quality of ledership. Scouter's Training Award, cloth, green knot on tan, No. 05008, Scouter, above left pocket. Scouter's Key, cloth, green and white knot on tan, green to right, No. 05006, Scouter, above left pocket. Recognizes certain leaders for completing at least three years of service, training, and quality program objectives. 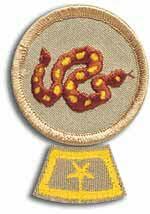 Scoutmaster Award of Merit (also Varsity Scout Team Coach), cloth, white knot on tan, No. 05001. Recognizes Scoutmasters and Coaches for their tenure, training, and quality crew program. * Nomination by Troop Committee Chair for PLC and Troop Comittee. *The Unit Leader Award of Merit replaces the Scoutmaster, Varsity Team Coach, and Venturing Crew Advisor award of merit programs. This new recognition has revised requirements, and Cubmasters are also eligible for this recognition. Unit Leader Award of Merit: Quality unit leadership is the key to a quality unit program—and it leads to better Scout retention. Statistics show that if young people stay engaged in the program for at least five years, the BSA’s influence likely will stay with them for the rest of their lives. A quality Scouting experience will help keep Scouts in the program, and the Boy Scouts of America created the Unit Leader Award of Merit to recognize the quality unit leaders who make that happen. Click here to download a nomination form for this award. The Professional Training Award may be earned by: Associate District Executives, District Executives, Senior District Executives, Exploring Executives, Senior Exploring Executives, District Directors, and Field Directors with supervisory responsibities. To earn the award, Professional staff Scouters must: complete or participate in five of eight training or coaching programs (including Wood Badge, Exploring Advanced Seminar, and National Camping School), successfully attend all three sessions of the Professional Executive Institute (PEI), and meet all critical achievements in his or her District/Division/Council for two of the three years. Click here for a list of requirements for this award. Venturing Advisor Award of Merit, cloth knot, white on tan, No. 05001, with Venturing device, No 00940. The Venturing Advisor Award of Merit recognizes Venturing Crew Advisors for tenure, training, and quality crew program. Venturing Leadership Award The Venturing Leadership Award is presented by councils, areas, regions, and the National Council to Venturers and adults who have made exceptional contributions to Venturing and who exemplify the Venturing Code. If you feel you know of someone deserving, then click here to download a nomination form. * Self-nomination automatically disqualifies a candidate. Sea Badge, cloth, blue Neptune's trident on silver, No. 05527, Sea Scouting leader, above left pocket. International Scouter's Award, cloth, white and purple square knot, purple worn to the right, restricted. Arrowhead Honor, silver arrowhead, Commissioners, left sleeve. BSA Speaker Bank In order to spread the message of Scouting, the BSA is maintaining a list of officially registered speakers to get the word out about Scouting. After a registered speaker conducts a minimum of 20 speeches and provides feedback, the speaker will receive a knot. Knot recipients will receive recognition at the National Annual Meeting. There is nothing else to do. If you are a registered BSA Speaker, and you give 20 speaches and then fill out the feedback, you will automatically be awarded this knot. Click here for a link to the official BSA Speaker's website. Philmont Training Center Masters, To earn this knot, you must first attend a training course at the Philmont Training Center. Then you must go back to the Philmont Training Center to take an additional course AND recruit 3 other scouts to go with you AND you must go back home and TEACH a BSA course (usually the course you took at Philmont). The course can be taught at the District, Council, Area or Regional level. Click here for a fact sheet about this award. Note: If you go back to the Philmont Training Center for a third time, and meet other requirements, you can earn a device to be worn on the knot. These awards are not earned but instead awarded to recognize leaders for outstanding service. Adult Religious Award, cloth, purple knot on silver, No. 05014, may be worn by adult members presented with the recognition, above left pocket. Adults may wear both knots if they satisfy qualifying criteria. Presented for faithful service while an adult leader. Requirements for this award vary from religion to religion. For more information on the specific requirements of your faith, please click here to visit P.R.A.Y. Distinguished Commissioner Service Award, cloth, silver knot on red, No. 05019, Scouter, above left pocket. Recognizes the active service of Unit Commissioners, District Commissions, and commissioners for at least 5 years and in meeting other quality and training criteria. Click here to download a fact sheet and a list of the requirements. District Award of Merit, cloth, silver overhand knot on dark blue, ends down, No. 05013. A council award for noteworthy service at the district level. If you feel you know of someone deserving, then click here to download a nomination form. Fill it out, and turn it in to your District Training Chair. Silver Beaver Award, cloth, blue and white knot on tan, blue to right, No. 05003. Established in 1931, the Silver Beaver Award is presented for distinguished service to young people within a BSA local council. If you feel you know of someone deserving, then click here to download a nomination form. Fill it out, and turn it in to your District Training Chair. Silver Antelope Award, cloth, gold and white knot on tan, gold to right, No. 05012A. The Silver Antelope Award, created in 1942, is granted for outstanding service to youth within the territory of a BSA region. If you feel you know of someone deserving, then click here to download a nomination form. Fill it out, and turn it in to your District Training Chair. Silver Buffalo Award, cloth, red and white knot on tan, red to right, No. 05004. The Silver Buffalo Award, created in 1925, is bestowed upon those who give truly noteworthy and extraordinary service to youth at the national level. If you feel you know of someone deserving, then click here to download a nomination form. * Self-nomination automatically disqualifies a candidate..
Silver World Award, cloth, red and white stripes, world, two stars are worn to the wearer's right, No. 05019. The Silver World Award, conceived in 1971, is presented by the BSA to world citizens who give outstanding service to their nation's youth or to young people in other countries. There are no specific requirements for this award, and there is no form to fill out. If you feel you know of someone deserving, then write a detailed letter of nomination, explaining what you believe are this person's qualifications, and why you think they should recieve this award. Then turn your nomination letter into your local Scout Executive for processing. Order of the Arrow Distinguished Service Award, cloth, white knot on red, No. 05528, Scout or Scouter, restricted. The Distinguished Service Award was created in 1940 to honor those who rendered service to the Order of the Arrow beyond the lodge level. If you feel you know of someone deserving, then click here to download a nomination form. Distinguished Eagle Scout Award, is the Eagle Scout knot (No. 05011) worn with the DESA miniature pin, No. 00094. The Eagle Scout recipient must have gained status of fame or eminence in their life work, and have shared their talents with their communities on a voluntary basis. George Meany Award cloth, blue knot on red and white, restricted. The George Meany Award is a national recognition presented to an adult union member who has made a significant contribution to the youth of their community through Scouting. If you feel you know of someone deserving, then click here to download a nomination form. Hornaday Award, cloth, blue, green, and white knot on tan. It recognizes unusual and distinguished service in natural resource conservation and environmental improvement at the regional, national, or international level. Whitney M Young Jr. Service Award Recognizes outstanding services by an adult individual or an organization for demonstrated involvement in the development and implementation of Scouting opportunities for youth from rural or low-income urban backgrounds. If you feel you know of someone deserving, then click here for a nomination form. ¡Scouting ... Vale la pena! Service Award Recognizes outstanding services by an adult individual or an organization for demonstrated involvement in the development and implementation of Scouting opportunities for Hispanic American/Latino youth. If you feel you know of someone deserving, then click here for the nomination form. Asian American Spirit of Scouting Service Award Recognizes outstanding services by an adult individual or an organization for demonstrated involvement in the development and implementation of Scouting opportunities for Asian American youth. If you feel you know of someone deserving, then click here for the nomination form. William D. Boyce Award, cloth, gray knot, gold, green, and red embroidery, No. 14269, Scouter, above left pocket. The William D. Boyce New-Unit Organizer Award is presented to recognize volunteers who organize one or more traditional Scouting units. If you feel you know of someone deserving, then click here and fill out the form and turn it in to the District Committee Chair. You may nominate yourself or others for this award by simply downloading the form, filling it out, and turning it in to your District Committee Chair. Community Organization Award, This square knot is worn by those whom have received an award from en external community organization, specifically recognized by the BSA's Relationships Division, while serving as an adult member of the BSA. The twelth, The George Meany Award of the American Federation of Labor & Congress of Industrial Organizations (AFL-CIO) is also part of this category, but retains the use of the original square knot designed for the Meany Award. Occasionally, a recipient of the Meany Award, at their discression, they may choose to wear the more generic Community Organization Award knot instead of the specific Meany knot, but they may NOT wear both (unless, of course, they happen to be a recipient of BOTH the Meany, and one of the other eleven recognized community organization awards). Click here for a general fact sheet on this award. Bravery Awards can be awarded to a youth or adult member and are some of the few knots that can be worn by a youth. Medal of Merit, cloth, gold and blue on tan, blue to right, No. 05025. The Medal of Merit may be awarded to a youth member or adult leader who has performed some outstanding act of service of a rare or exceptional character that reflects an uncommon degree of concern for the well-being of others. If you feel you know of someone deserving, then click here to download a nomination form. Heroism Award, cloth, red on white twill, No. 05020. The Heroism Award may be awarded to a youth member or adult leader who has demonstrated heroism and skill in saving or attempting to save life at minimum risk to self. If you feel you know of someone deserving, then click here to download a nomination form. Honor Medal, cloth, red knot on tan, No. 05010. The Honor Medal may be awarded to a youth member or adult leader who has demonstrated unusual heroism and skill in saving or attempting to save life at considerable risk to self. If you feel you know of someone deserving, then click here to download a nomination form. The following devices may be worn on knots, as appropriate. These devices should be stocked by your local Scout Shop or council trading post, along with all other advancement items. They are not be available at commercial Scout supply distributors. The Exploring Device shown is no longer listed in the Insignia Guide. It had the same stock number as the current Venturing Device (No. 00930), and may no longer be available. There are two additional devices, not shown above, that are worn on the James West Fellowship Knot, to recognize major donors, the 1910 Society pin and the Founders Circle pin. Those devices and the qualifications for them can be seen on the page that describes the James West Fellowship Knot, by clicking here. Is there a right way (and a wrong way) to wear knots? Yes there is. Click on this link for the explanation from the BSA Insignia Guide. 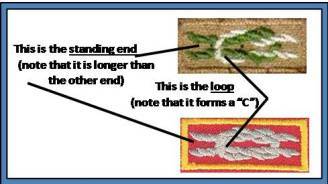 "The loop (TOP Bight) of the embroidered square knot that comes in FRONT of the standing part (the part to the left as you are looking at it) is ALWAYS to the wearer's right." For 100 years, the Boy Scouts of America has created a strong foundation of leadership, service, and community for millions of America's youth. Through A Year of Celebration, A Century of Making a Difference, we will demonstrate the incredible impact of a century of living the Scout Law. Program participants will earn recognition for making a difference in their communities due to their dedication to five of Scouting's core values: Leadership, Character, Community Service, Achievement, and the Outdoors. Through that commitment, participants can earn each of five award ribbons to display from our 100th Anniversary commemorative patch. 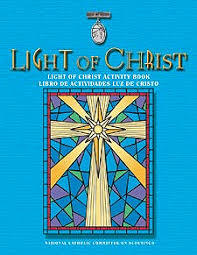 A Year of Celebration will take place from September 1, 2009 through December 31, 2010. The program is open to all Cub Scouts, Boy Scouts, Venturers, adult leaders, and Scouting alumni. Read the patch requirements to learn more. FINISHED WITH REQUIREMENTS? CLICK HERE TO ORDER THE YEAR OF CELEBRATION AWARDS.Questions about the ordering process? Click here for answers to some of the most commonly asked. For 100 years, the Boy Scouts of America has created a strong foundation of leadership, service, and community for America's youth. Through A Year of Celebration, we celebrate this legacy and commit ourselves to inspire and prepare future generations.